Cities: Capital--Dublin (pop. 505,739). Other cities--Cork (119,143), Galway (71,983), Limerick (52,560), Waterford, (45,775). Population growth rate: 1.53 (2004). Religions: Roman Catholic 88.4%; Church of Ireland 2.9%; Presbyterian 0.52%; Methodist 0.25%; Muslim 0.49%; Jewish 0.1%; other 4%. Education: Compulsory up to age 16. Enrollment rates: first (primary) level 449,508, second (high school and vocational) level 335,162, third (university and college) level 133,691. Literacy--98%-99%. Health: Infant mortality rate--4.9/1,000. Life expectancy at birth--male 75.1 yrs., female 80.3 yrs. Work force: Services--66%; industry--28%; agriculture--6%. Nominal GDP (2005): $160.3 billion. Real GDP growth (2005): 4.7%. Nominal GDP per capita (2005): $38,812. Agriculture (3% of GDP): Products--cattle, meat, and dairy products; potatoes; barley; sugarbeets; hay; silage; wheat. Industry (32% of GDP): Types--food processing, beverages, engineering, computer equipment, textiles and clothing, chemicals, pharmaceuticals, construction. Trade (2005): Exports--$89 billion (excluding services): machinery, transport equipment, chemicals, food, live animals, manufactured materials, beverages. Imports--$57.4 billion (excluding services): grains, petroleum products, machinery, transport equipment, chemicals, textile yarns. Major suppliers-Great Britain and Northern Ireland 31%, U.S. 11%, Germany 8%, China 7%, Japan 4%, France 3%, rest of the world (including other EU Member States) 36%. Ireland is a sovereign, independent, democratic state with a parliamentary system of government. The president, who serves as head of state in a largely ceremonial role, is elected for a 7-year term and can be re-elected only once. The current president is Mary McAleese, who is serving her second term after having succeeded President Mary Robinson - the first instance worldwide where one woman has followed another as an elected head of state. In carrying out certain constitutional powers and functions, the president is aided by the Council of State, an advisory body. On the Taoiseach's (prime minister's) advice, the president also dissolves the Oireachtas (Parliament). The prime minister (Taoiseach, pronounced "TEE-shuck") is elected by the Dail (lower house of Parliament) as the leader of the political party, or coalition of parties, which wins the most seats in the national elections, held approximately every 5 years (unless called earlier). Executive power is vested in a cabinet whose ministers are nominated by the Taoiseach and approved by the Dail. Local government is by elected county councils and--in the cities of Dublin, Cork, Limerick, and Waterford--by county borough corporations. County councils/corporations in turn select city mayors. In practice, however, authority remains with the central government. Irish politics remain dominated by the two political parties that grew out of Ireland's bitter 1922-23 civil war. Fianna Fail was formed by those who opposed the 1921 treaty that partitioned the island. Although treaty opponents lost the civil war, Fianna Fail soon became Ireland's largest political party. Fine Gael, representative of the pro-treaty forces, remains the country's second-largest party. The Progressive Democrats, Labour, Sinn Fein, and the Greens are the other significant parties. In the 2002 general elections, "Independent" TDs began to emerge as a political force, with 14 "Independent" TDs elected to the Dail. The May 2002 national elections returned Fianna Fail and its coalition partner, the Progressive Democrats, to power, a coalition that had governed since the 1997 elections. Prime Minister Ahern was re-elected Taoiseach and Mary Harney was reappointed as Deputy Prime Minister (Tanaiste, pronounced "TAW-nish-tuh"). Local and European elections took place in June 2004 and saw gains for opposition parties. The election also featured a referendum on citizenship. Until that time, Ireland had granted citizenship on the basis of birth on Irish soil. Concerns about security and social welfare abuse prompted the government to seek to bring citizenship laws in line with the more restrictive policies prevalent in the rest of Europe, and the 2004 referendum measure passed by a wide majority. Now, persons with non-Irish parents can acquire Irish citizenship at birth only if at least one parent has been resident in Ireland for three years preceding the birth. Ireland is preparing for the next national elections, which must be held by June 2007. Taoiseach Bertie Ahern plans to lead the Fianna Fail party's campaign, in pursuit of his third consecutive term as prime minister. The Progressive Democrats will be led by Michael McDowell, the current Minister for Justice, Equality and Law Reform, who succeeded Mary Harney in 2006 as party leader and Tanaiste following her resignation from both posts. Consolidating the peace process in Northern Ireland and encouraging the full implementation of the 1998 Good Friday Agreement (GFA) and the 2006 St. Andrews Agreement remain U.S. priorities in Ireland. The conflict in Northern Ireland stems from a history of British rule, historical animosity between Catholics and Protestants, and the various armed and political attempts to unite Northern Ireland with the rest of the island. "Nationalist" and "Republican" groups seek a united Ireland, while "Unionists" and "Loyalists" want Northern Ireland to remain part of the United Kingdom. After decades of violence by both Republican and Loyalist paramilitaries, most notably the Irish Republican Army (IRA), the British and Irish governments negotiated an IRA ceasefire in 1994, which was followed by the landmark U.S.-brokered Good Friday Agreement (GFA) in 1998. The GFA established a power-sharing legislative assembly to serve as the autonomous local government of Northern Ireland. The 108-member Northern Ireland Assembly is led by a first minister and deputy first minister, one from each of the two communities, and a 10-minister executive. The GFA also provided for changes in both the British and Irish constitutions. Ireland ceded territorial claim to Northern Ireland, and the U.K. agreed that Northern Ireland could become part of Ireland if a majority (North and South) so voted in the future. Finally, the GFA provided the blueprint for "normalization," to include the eventual removal of British forces, devolution of police and justice functions, and guarantees of human rights and equal opportunity for all individuals. The agreement was approved in a 1998 referendum by 71% of Northern Ireland voters and 95% of Irish voters. The major political parties in Northern Ireland are the Democratic Unionist Party (DUP), Sinn Fein, the Ulster Unionist Party (UUP), and the Social Democratic and Labor Party (SDLP). The UUP and SDLP are centrist Unionist and Nationalist parties, respectively, while Sinn Fein is strongly Republican and the DUP is strongly Unionist. From the time the Assembly was created in 1998 until 2003, the UUP and SDLP were the governing parties. The British and Irish Governments attempted in October 2003 to conclude a deal with the parties to restore government, but failed to reach agreement. Elections to the suspended Assembly still went forward the following month, turning the more moderate UUP and SDLP out of power and installing the strongly Unionist DUP and strongly Republican Sinn Fein. In late 2004, the British and Irish Governments again attempted, but failed, to negotiate an agreement with the parties on devolution. The weeks following the breakdown in talks saw an armed robbery of Belfast's Northern Bank and a highly publicized murder within the Republican community, with strong allegations of IRA involvement in both cases. Since 2005, there have been significant steps to reinvigorate the peace process. In July 2005, the IRA unilaterally announced that it would end its "armed struggle" and rely upon solely peaceful and democratic means to achieve its political objectives. The Independent International Commission on Decommissioning (IICD) confirmed in September 2005 that the IRA had effectively put its weapons "beyond use." A series of reports by the International Monitoring Commission also noted significant progress by the IRA in its move away from criminality. Following upon this momentum, the British and Irish Governments in April 2006 launched a new negotiation process that envisioned the restoration of the Assembly and the selection of the First Minister and Deputy First Minister by year's end. This process led to a summit at St. Andrews, Scotland, in October 2006, which yielded an agreement by the parties to restore devolved government by the spring of 2007 following Assembly elections in the North (and a form of electoral endorsement to be chosen in the South). The St. Andrews Agreement specifically called for Republican endorsement of policing and the criminal justice system as well as Unionist commitment to political power-sharing. The political parties and the British, Irish, and U.S. Governments are working on mechanics for implementing the St. Andrews Agreement. Current efforts center on resolving differences between the DUP and Sinn Fein on policing issues and power-sharing. As part of these efforts, the U.S. Embassy in Dublin coordinates regularly with the U.S. Embassy in London, the U.S. Consulate in Belfast, and the office of the President's Special Envoy for Northern Ireland. The United States also continues to provide funding ($18.4 million in 2005) for projects administered under the International Fund for Ireland (IFI), created in 1986 to generate economic opportunity and cross-community engagement in the border areas, both North and South. Since the IFI's establishment, the U.S. Government has contributed $471 million, roughly half of total IFI funding. Ireland boasts a vibrant, globalized economy, with GDP per capita second only to Luxembourg's in the EU. The "Celtic Tiger" period of the mid-late 1990s saw several years of double-digit GDP growth, driven by a progressive industrial policy that boosted large-scale foreign direct investment and exports. GDP growth dipped during the immediate post-9/11 global economic slowdown, but has averaged roughly 5 percent yearly since 2004, the best performance for this period among the original EU 15 Member States. Since 2004, the Irish economy has generated roughly 90,000 new jobs annually, attracting over 200,000 foreign workers, mostly from the new EU accession states, in an unprecedented immigration influx. The construction sector has accounted for approximately one-quarter of these jobs, and economists caution that any slowdown in Ireland's vibrant housing market would have ramifications for continued GDP growth. Economic and trade ties are an important facet of overall U.S.-Irish relations. In 2005, U.S. exports to Ireland were valued at $9 billion, while Irish exports to the U.S. totaled $28 billion, according to the U.S. Department of Commerce. The range of U.S. exports includes electrical components and equipment, computers and peripherals, drugs and pharmaceuticals, and livestock feed. Irish exports to the United States represent approximately 20% of all Irish exports, and have roughly the same value as Irish exports to the UK (inclusive of Northern Ireland). Exports to the United States include alcoholic beverages, chemicals and related products, electronic data processing equipment, electrical machinery, textiles and clothing, and glassware. According to Ireland's Central Statistical Office, Irish exports to the United States from January to September 2006 rose by 7% compared to the same period in 2005, while Irish imports from the United States from January to September 2006 fell by 14% compared to the same period in 2005. U.S. investment has been particularly important to the growth and modernization of Irish industry over the past 25 years, providing new technology, export capabilities, and employment opportunities. As of year-end 2005, the stock of U.S. foreign direct investment in Ireland stood at $62 billion, more than double the U.S. total for China and India combined ($25.3 billion). Currently, there are approximately 620 U.S. subsidiaries in Ireland, employing roughly 100,000 people and spanning activities from manufacturing of high-tech electronics, computer products, medical supplies, and pharmaceuticals to retailing, banking, finance, and other services. In more recent years, Ireland has also become an important research and development (R&D) center for U.S. firms in Europe. Many U.S. businesses find Ireland an attractive location to manufacture for the EU market, since it is inside the EU customs area and uses the euro. In 2005, U.S. firms accounted for 61% of Ireland's total exports of euro 89 billion. 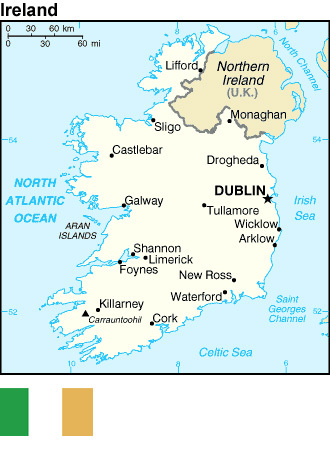 Other reasons for Ireland's attractiveness include: a 12.5 percent corporate tax rate for domestic and foreign firms; the quality and flexibility of the English-speaking work force; cooperative labor relations; political stability; pro-business government policies; a transparent judicial system; and, the pulling power of existing companies operating successfully (a "clustering" effect). Factors that negatively affect Ireland's ability to attract investment include: increasing labor and energy costs (especially when compared to low-cost countries in Eastern Europe and Asia), skilled labor shortages, inadequate infrastructure (such as in the transportation and internet/broadband sectors), and absolute price levels that are ranked among the highest in Europe. Ireland is a member of numerous international organizations, including the United Nations, the Organization for Security and Cooperation in Europe, and the European Union. Ireland has been an important contributor to numerous international peacekeeping missions, such as in Lebanon (UNIFIL), Liberia (UNIMIL), and the Balkans (KFOR and EUFOR). Ireland's overseas development assistance focuses on Sub-Saharan Africa and stands at 5 percent of GDP. U.S. relations with Ireland have long been based on common ancestral ties and shared values. These relations have broadened and matured, given the significant U.S. role in Ireland's economic success and cooperation on global challenges. Besides regular dialogue on political and economic issues, the U.S. and Irish Governments have official exchanges in areas such as medical research and education. With Ireland's membership in the European Union, the discussion of EU trade and economic policies, as well as other aspects of EU policy, is also a key element in the U.S.-Irish relationship. In recent years, Ireland has attempted to act as a diplomatic bridge between the United States and European Union. During its 2004 EU presidency, Ireland worked to strengthen U.S.-EU ties that had been strained by the Iraq war, and the current EU Ambassador to the United States is former Irish Prime Minister John Bruton. Emigration, long a vital element in the U.S.-Irish relationship, declined significantly with Ireland's economic boom in the 1990s. For the first time in its modern history, Ireland is experiencing high levels of inward migration, a phenomenon with political, economic, and social consequences. However, Irish citizens do continue the common practice of taking temporary residence overseas for work or study, mainly in the U.S., U.K., and elsewhere in Europe, before returning to establish careers in Ireland. The U.S. J-1 visa program, for example, remains a popular means for Irish youths to work temporarily in the United States.